Say yes, if you want a natural setting, viewing over the extensive beautiful grounds, of verdant greenery, landscaped bushes and trees and a meandering creek through the property, that is extremely adaptable right down to the size of the dance floor. While not right within Vancouver proper, this surprising alternative is just a short distance away, and one bonus at this private club is that they can and have organized a wedding in as short a time as two weeks! May 11th, 2017: This last comment in slightly amended that Quilchena Golf and Country Club is in the process of seeking out a new Catering Manager, so how quickly your wedding can come together depends in part on what the skill sets are of the next Catering Manager. Will keep you updated! Located in Richmond, British Columbia, Quilchena Golf & Country Club is set in a natural setting offering breathtaking views conveniently just minutes away from Vancouver and its airport, creating easy access for your out of town guests. Set on a majestic, natural setting, this venue offers beautiful views everywhere to create a memorable wedding celebration. The local First Nations peoples called the low-lying land “Quilchena” meaning running water, sweet water, or many waters. “Quilchena” was chosen as the name for the fledgling golf club in 1925. That this is a possible wedding venue may come as a surprise to you. Not necessarily a common wedding event place as they do little advertising. Weddings come as secondary to their main purpose. They are a private members club, which has surprising pros and cons. 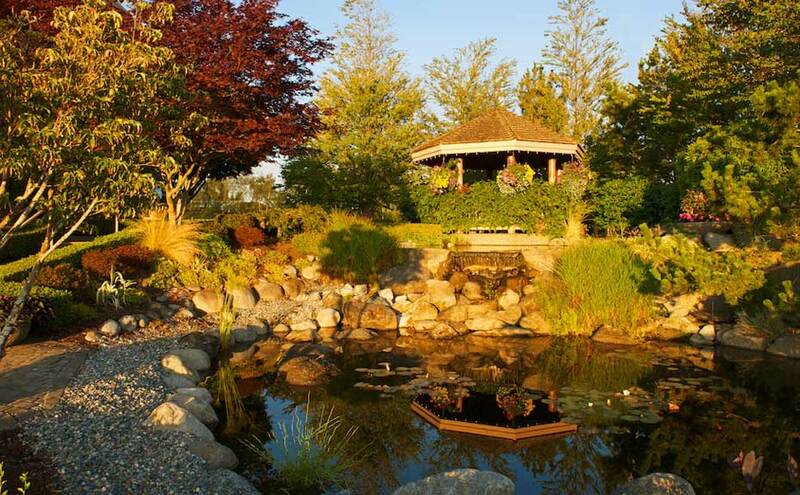 The facilities found at Quilchena Golf & Country Club include a lovely gazebo in a wonderfully rich landscaped environment, available to the bridal party overlooking the pond as well as a spacious clubhouse with spaces that are versatile and adaptable to each event’s needs. The facilities have a maximum capacity for up to 240 guests. There is a rich chestnut wood paneled, curving staircase that leads from the first to the second floor, a very country club type of environment that you will have to take advantage of when you are taking photographs for your wedding memories. From the windows to the parquet dance floors to the elegant dark rich wooden columns and the wood paneled curving staircase, if you enjoy the look of natural wood as a décor statement this might be the place for you. But if light and bright and modern is your thing, look elsewhere. Online and on their website you will notice that it mentions that Quilchena is ideal for intimate gatherings and wedding parties of up to 240 guests. They are very open, and upfront in stating that this number is the upper limit and a more realistic number depending on how your wedding is set up is maximum 180, and if you are looking at a dinner and wedding dance, probably 150 is probably a much more realistic number. If you are only doing cocktails, they can do up to 300. As already mentioned for weddings one of the banquet rooms The Mountain View room is reserved for the bride and the bridal party. The Fairway adjoins to the dining room The Arbutus which can allow you to increase the numbers somewhat. If you wish to book both banquet rooms though there is an additional charge as the additional room is the actual dining room for the private club members which once booked is closed down to the private members for the night. Just remember that while adjoined they are not adjoined directly, and your guests will be somewhat separated. Probably one of the best features of this particular venue are the views. The landscaped fairways, with a meandering creek, are green and luscious and the expansive casement wood framed windows makes you feel like you are enveloped in this rich green environment. They list three possible banquet rooms the Arbutus, the Mountain View and Fairway Banquet rooms, each with their own balconies. The fairways provide a natural clean, green Vista to gaze over from the balconies creating a peaceful and restful background. If you need help in organizing for the big day, Quilchena offers event services. Just remember this is not the same as hiring a wedding planner. An event planner is there to help you with the choices that are available at this particular venue for this particular event. The advantage, of course, is that the individual that you are talking to knows this venue inside and out and is the expert when it comes to this facility. But remember their job is to organize events of all sorts from business conferences on down, whereas a wedding planner specializes in working only on weddings and goes into areas of planning and preparing for a wedding that an event planner would never get into. While the Quilchena website advertises three banquet rooms, when there is a wedding in progress the Mountain View Room is set up as the bridal suite but once again the groomsmen are left out to lunch. Too many venues cater to the bride but seem to forget that there are two people getting married. Any wedding venue should include a room for the groom and groomsmen to get ready, to relax and a private place away from the guests. While with some wedding venues you have access to the gardens and grounds, here at the Quilchena Golf & Country Club you have to remember that you are booking a private members club. As mentioned previously this creates unique pros and cons to working with a private members club. One of those issues is that in this time of the internet and with brides being tech savvy and relying on the internet as their go to source for information, going to the website of the Quilchena Golf & Country Club leads to only 4 short paragraphs of information. Currently the most exhaustive source of information, on the Quilchena Golf & Country Club as a wedding venue, available on the net is this article. Another issue is that as a private members golf club while you do have access to the outside gazebo, which provides you with a beautifully rich background for your wedding portfolio, that is the entire area that you are restricted to. The grounds themselves are restricted to the private members and are not available for wedding photo ops. So if you were looking forward to taking advantage of luscious gardens or sea and mountain views being including in your wedding portfolio, you will either be out of luck or you will have to make an effort to have your wedding bridal group pictures taken elsewhere. Which is a common practice so this may not be a con for every bridal couple. But there is always an advantage to being able to have a venue where the venue itself lends itself to a brilliant background for your wedding photography. Remember this is a private facility and as gorgeous as it may be advertised it is not available to you and access to the complete grounds are limited to the members. The other thing you will need to consider is that while you have access to the outside space of the gazebo that there is a limitation of a 100 people that can access the gazebo at any one time. Again this number is probably pushing it and we are told that 80 is probably a safer number to plan on. So while the facility can host your dinner and dance for up to 150 people that if you want to have the wedding ceremony here as well that this will place limitations on the number of wedding guests versus dinner guests. For those that are looking to host both at the same venue this means this limits this wedding venue to fairly small weddings. te rooms of their own to retire to, rest and relax, change if necessary, or just get away for a break. Traveling from the facility that you are wed to where they are booked to stay for the night if they are out of town guests may require transportation especially if they have been celebrating with wine and champagne. While the Vancouver Airport is only 15 minutes away, it is an hour by bus. Quilchena is somewhat different than some event venues and planners in that they are more than happy to work with you to not only drive which of their specialized catering services is right for you but surprisingly are also happy to help you book those outside preferred vendors that they have already established a relationship with. Please note that this policy may be subject to change and this list of preferred vendors will only be available once the new catering manager is in place. Again stay tuned to this space for the latest updates. Quilchena Golf & Country Club offers couples the usual for their wedding day. The services include set up & clean up, bridal suite, event planning, catering/bar and outside vendors. Services include set up and clean up. Everything you need will be in place on the big day. But there are limitations. While they are happy to set up the head table and tables and chairs as desired, that is where their services end. For example, they do not set up chair covers, so make sure that you ask questions and find out exactly what they will and won’t set up for you. You don’t want to be surprised at the last minute. Once you have met with the event planner who will help you with everything from helping you set up the catering and booking any outside vendors you are on your own. This venue has an on-site Catering Manager and a talented team of chefs that will skillfully design a wedding menu just for you. The cuisine options include buffet, cocktail reception, dessert, hors d’oeuvres, plated, server(s), stations and tastings. The one advantage of hosting your wedding at a place that is set up for event service that you can just go online and download the catering menu to find what is available, there is no mark-up for a wedding menu. Parking, Parking and MORE Parking!! Time and again, as we check out wedding venues, one of the consistent issues are the limitations of parking available. Welcome to Vancouver! While you might not think it is one of the major factors of deciding where your wedding should be held, you might want to take a moment and rethink that position. 150 to 200 guests require a lot of parking. Wedding affairs are frequently are family affairs with younger children and frequently multi-generational. At Quilchena they have endless space and parking and all of it is free. Truly a blessing when you bring together this many people. Wonderful not to have to walk for several blocks just to get to the wedding venue. Stay tuned as we keep you up to date on the latest updated news on what is happening with this venue. When a new catering manager comes in there are always changes.